Imprisoned for all eternity, the unspeakable crimes of this inmate are lost to memory. 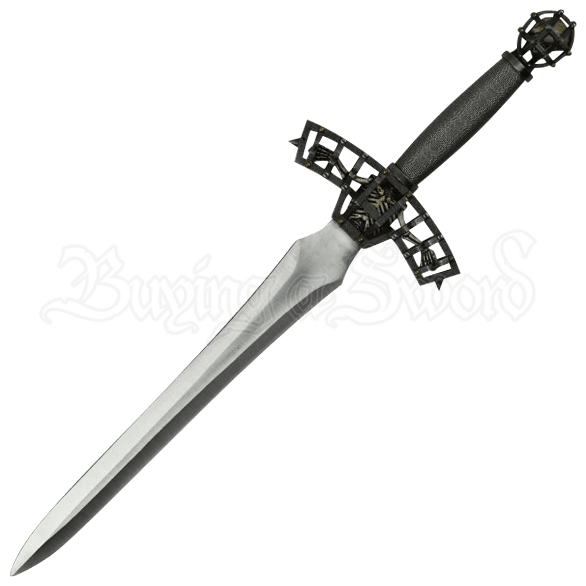 An intriguing weapon worthy of display, the Caged Skeleton Dagger features a skeleton prisoner trapped within its unique, medieval style hilt. Made of stainless steel, this decorative dagger comes with a wooden display base, making it the perfect accessory for a desk, mantle, or other large shelf space. The torso of the skeleton forms the crossguard, its arms reaching outward within the bars of its spiked prison. Wire wrapping textures the hilt, forming a firm grip. The round pommel of this large skeleton dagger features a trapped skull head, held captive within the curved bars. A statement piece in even the most macabre of displays, this decorative gothic blade makes a great collectible or gift for fans of horror and those who appreciate the scarier side of the Middle Ages.